At the intersection of a robust housing market, new business development and neighborhood beautification, you’ll find a flourishing arts district—a location that has not only been a strong contributor to Cleveland’s renaissance, but also embodies the energy and entrepreneurial spirit of our Startup Scaleup event. This place is the Gordon Square Arts District (GSAD). 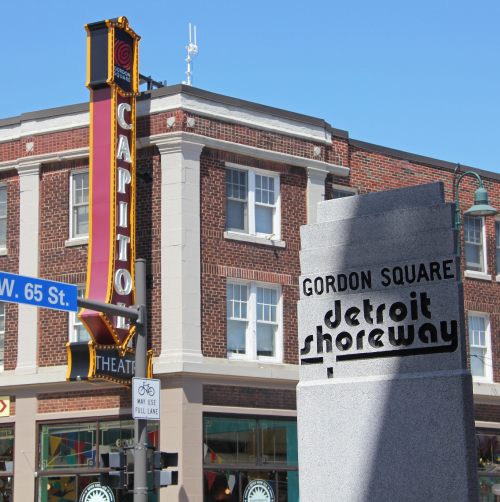 As part of the larger Detroit Shoreway neighborhood, GSAD has become a hub of economic upturn on Cleveland’s West Side, helping to infuse more than a half-billion dollars in the surrounding community. The region is also home to a tight-knit community of entrepreneurial businesses. In fact, more than 80 new businesses have opened in the area in less than a decade! And the neighborhood has no plans of slowing down. Over the last decade, several projects have been completed and a number of investments have been made that support GSAD’s main objective of building up the strength, health and livability of the surrounding community. This goal aligns well with JumpStart’s own mission to strengthen the economic vitality of Northeast Ohio and the U.S. by helping communities realize their entrepreneurial potential. Not only does Gordon Square make sense from a vibrant, entrepreneurial community standpoint, but the walkability of the location is second to none. With the sheer amount of sessions and workshops taking place at Startup Scaleup 2017, we needed a walkable location where we could still spread out. Beyond that, the energy in Gordon Square is simply contagious. Entrepreneurs, artists and innovators come together to connect and revitalize our city. We encourage you to come experience all that Gordon Square has to offer while learning, networking and celebrating Northeast Ohio’s unique entrepreneurial community at Startup Scaleup 2017! To help you navigate the neighborhood on event day, we have added an interactive map to the Startup Scaleup mobile app. Download the app here. Haven’t registered yet? There’s still time! Click here to register for Startup Scaleup 2017.